A stunningly packaged, definitive guide to bar-building from one of the world’s most acclaimed bartenders. Meehan’s Bartender Manual is acclaimed mixologist Jim Meehan’s magnum opus—and the first book to explain the ins and outs of the modern bar industry. This groundbreaking work chronicles Meehan’s storied career in the bar business through practical, enlightening chapters that mix history with professional insight. Meehan’s deep dive covers the essential topics, including the history of cocktails and bartending, service, hospitality, menu development, bar design, spirits production, drink mixing technique, and the tools you’ll need to create a well-stocked bar—all brought to life in over 150 black- and-white illustrations by artist Gianmarco Magnani. The book also includes recipes for 100 cocktail classics--including Meehan originals--plus insights as to why he makes them the way he does, offering unprecedented access to a top bartender’s creative process. Organized by spirit base, the recipes contain detailed annotations and are accompanied by fine art photographer Doron Gild’s breathtaking, full-color photos. Thoughtful contributions from more than 50 colleagues around the world who’ve greatly contributed to global cocktail culture further contextualize Meehan’s philosophy. Timeless black-and-white portraits of these industry experts round out this comprehensive tome. This densely informative, yet approachable manual is presented in an iconic package--featuring a textured cover with debossed type, rounded corners, and nearly 500 pages--making it an instant classic to be enjoyed now, and for years to come. 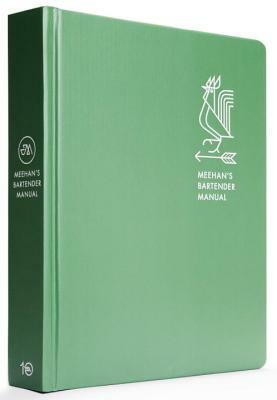 Whether you’re a professional looking to take your career to the next level or an enthusiastic amateur interested in better understanding concepts like mise en place and the mechanics of drink making, Meehan’s Bartender Manual is the definitive modern guide. JIM MEEHAN is a renowned bartender and author of The PDT Cocktail Book.He worked at some of New York City’s most revered restaurants and bars, includingGramercy Tavern and Pegu Club, before opening the James Beard Award–winningbar PDT in 2007. In addition to writing for Tasting Table, Lucky Peach, and SommelierJournal, Meehan served as an editor for Food & Wine magazine’s annual cocktailbook and Mr. Boston Official Bartender’s Guide. He and his family reside in Portland,Oregon, where he runs the consulting firm Mixography, Inc.
"Absolutely necessary for any spirits dork." "One of the most recognizable names in the bar world brings you the ultimate cocktail guide, complete with recipes, origin stories and hacks—because not owning an esoteric bottle of bitters shouldn't hold you back from a good drink. There are also floor plans of bars around the world and deep-cut cocktail facts for those who want to geek out." "For anyone obsessed with cocktails and their unique subculture, this book will be fascinating and essential, a heady tome that pores over the origins of whiskey and gin like a graduate school volume." "Jim Meehan was among the pioneers of the craft cocktail movement, opening PDT in Manhattan in 2007. “Meehan’s Bartender Manual” is exactly what the title promises: a manual for professional bartenders. But it will make a welcome addition to the library of any serious at-home drink maker." "When he opened New York’s PDT in 2007, Jim Meehan helped kick off the speakeasy trend, and in 2012, the bar scored the first James Beard Award for Outstanding Bar Program. Now Meehan has distilled his bar expertise into this combination recipe book and bar industry guide. " "Jim Meehan’s 'Bartender Manual' a must-read for pros, home mixologists alike." "A knowledge-filled tome for true cocktail nerds or those apsiring to be—it has insights from the who's-who of the bar-and-spirits world and perfected recipes of classics drinks."